Upgrade to Advanced Photon Source will open new frontiers in science and help solve pressing problems across industries. The U.S. Department of Energy (DOE) has approved the technical scope, cost estimate and plan of work for an upgrade of the Advanced Photon Source (APS), a major storage-ring X-ray source at DOE’s Argonne National Laboratory, Argonne announced on December 14, 2018. The resulting facility will allow researchers to view matter at the atomic scale, in three dimensions, opening new frontiers in discovery science, from advances in pharmaceuticals to new materials for better rechargeable batteries. The APS, a DOE Office of Science User Facility, produces extremely bright, extremely focused X-rays that can peer through dense materials and illuminate matter at the molecular level. By way of comparison, the X-rays produced at today’s APS are up to one billion times brighter than the X-rays produced in a typical dentist’s office. The APS Upgrade project (APS-U) will increase the brightness of these super-bright X-rays another 100 to 1,000 times, depending on the technique used, which will allow scientists to map any atom’s position, identity and dynamics. The goal of the $815 million project is to replace the APS accelerator and develop or update X-ray beamlines and other equipment to create a much more powerful X-ray facility. The APS-U will have a new design, a ​“multi-bend achromat” lattice, with many more bending magnets and magnet-focusing cells than the present machine, resulting in much brighter X-ray production. X-rays at the APS are produced by electrons that are accelerated to very high energies, moving at nearly the speed of light as they pass though magnet arrays around a 1.1-kilometer circular storage ring. X-rays are extracted from the storage ring into beamlines, which are equipped with experimental endstations. There, researchers use varying instrumentation to investigate the structure and chemistry of matter in a wide variety of systems across a broad spectrum of time and energy scales. Every year, more than 5,500 researchers from across the world conduct experiments at the APS. Studies at the APS have led to two Nobel Prizes, numerous pharmaceutical drugs (including the first drug to treat HIV), improved processes for oil extraction from shale and new insights into additive manufacturing. Scientists at the APS have also studied the composition of an ancient Egyptian mummy and the arms of SUE, the Tyrannosaurus rex specimen at The Field Museum of Chicago. The Advanced Photon Source is one of the most powerful X-ray facilities in the world, and the APS-U will ensure that the U.S. keeps this leadership position. New or upgraded facilities similar to the APS are being planned or are under construction in France, Brazil, China, Japan and other countries. The APS was commissioned in 1996, at Argonne’s campus, and the APS-U builds on the $1.5 billion of infrastructure that is already in place. The approval from DOE is formally called Critical Decision 2, or CD-2, and indicates that the project has received baseline approval for its design and implementation. Another critical decision, CD-3, is needed in the future in order for the project to receive full spending authority for the baseline funding approved by CD-2. Depending on the Congressional appropriation process, removal of the old storage ring and installation of the new one could begin in 2022. This installation ​“dark time” and subsequent ring commissioning period will last for about one year, after which the APS-U X-ray beamlines will be brought online for researchers. Argonne National Laboratory seeks solutions to pressing national problems in science and technology. 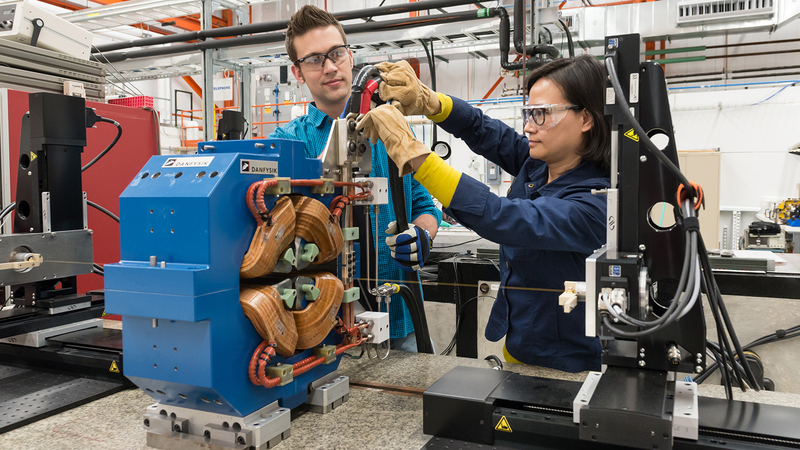 The nation’s first national laboratory, Argonne conducts leading-edge basic and applied scientific research in virtually every scientific discipline. Argonne researchers work closely with researchers from hundreds of companies, universities, and federal, state and municipal agencies to help them solve their specific problems, advance America’s scientific leadership and prepare the nation for a better future. With employees from more than 60 nations, Argonne is managed by UChicago Argonne, LLC for the U.S. Department of Energy’s Office of Science. For more visit http://www.anl.gov. The Advanced Photon Source at Argonne National Laboratory is one of five national synchrotron radiation light sources supported by the U.S. Department of Energy’s Office of Science to carry out applied and basic research to understand, predict, and ultimately control matter and energy at the electronic, atomic, and molecular levels, provide the foundations for new energy technologies, and support DOE missions in energy, environment, and national security. To learn more about the Office of Science X-ray user facilities, visit http://science.energy.gov/user-facilities/basic-energy-sciences/. It’s 4 a.m., and I’ve been up for about 20 hours straight. A loud alarm is blaring, accompanied by red strobe lights flashing. A stern voice announces, “Searching station B. Exit immediately.” It feels like an emergency, but it’s not. In fact, the alarm has already gone off 60 or 70 times today. It is a warning, letting everyone in the vicinity know I’m about to blast a high-powered X-ray beam into a small room full of electronic equipment and plumes of vaporizing liquid nitrogen. In the center of this room, which is called station B, I have placed a crystal no thicker than a human hair on the tip of a tiny glass fiber. I have prepared dozens of these crystals, and am attempting to analyze all of them. These crystals are made of organic semiconducting materials, which are used to make computer chips, LED lights, smartphone screens and solar panels. I want to find out precisely where each atom inside the crystals is located, how densely packed they are and how they interact with each other. This information will help me predict how well electricity will flow through them. To see these atoms and determine their structure, I need the help of a synchrotron, which is a massive scientific instrument containing a kilometer-long loop of electrons zooming around at near the speed of light. I also need a microscope, a gyroscope, liquid nitrogen, a bit of luck, a gifted colleague and a tricycle. The first step of this experiment involves placing the super-tiny crystals on the tip of the glass fiber. I use a needle to scrape a pile of them together onto a glass slide and put them under a microscope. The crystals are beautiful – colorful and faceted like little gemstones. I often find myself transfixed, staring with sleep-deprived eyes into the microscope, and refocusing my gaze before painstakingly coaxing one onto the tip of a glass fiber. Once I’ve gotten the crystal attached to the fiber, I begin the often frustrating task of centering the crystal on the tip of a gyroscope inside station B. This device will spin the crystal around, slowly and continuously, allowing me to get X-ray images of it from all sides. As it spins, liquid nitrogen vapor is used to cool it down: Even at room temperature, atoms vibrate back and forth, making it hard to get clear images of them. Cooling the crystal to minus 196 degrees Celsius, the temperature of liquid nitrogen, makes the atoms stop moving so much. Once I have the crystal centered and cooled, I close off station B, and from a computer control hub outside of it, blast the sample with X-rays. The resulting image, called a diffraction pattern, is displayed as bright spots on an orange background. What I am doing is not very different from taking photographs with a camera and a flash. I’m about to send light rays at an object and record how the light bounces off it. But I can’t use visible light to photograph atoms – they’re too small, and the wavelengths of light in the visible part of the spectrum are too big. X-rays have shorter wavelengths, so they will diffract, or bounce off atoms. However, unlike with a camera, diffracted X-rays can’t be focused with a simple lens. Instead of a photograph-like image, the data I collect are an unfocused pattern of where the X-rays went after they bounced off the atoms in my crystal. A full set of data about one crystal is made up of these images taken from every angle all around the crystal as the gyroscope spins it. My colleague, Nicholas DeWeerd, sits nearby, analyzing data sets I’ve already collected. He has managed to ignore the blaring alarms and flashing lights for hours, staring at diffraction images on his screen to, in effect, turn the X-ray images from all sides of the crystal into a picture of the atoms inside the crystal itself. In years past, this process might have taken years of careful calculations done by hand, but now he uses computer modeling to put all the pieces together. He is our research group’s unofficial expert at this part of the puzzle, and he loves it. “It’s like Christmas!” I hear him mutter, as he flips through twinkling images of diffraction patterns. I smile at the enthusiasm he’s managed to maintain so late into the night, as I fire up the synchotron to get my pictures of the crystal perched in station B. I hold my breath as diffraction patterns from the first few angles pop up on the screen. Not all crystals diffract, even if I’ve set everything up perfectly. Often that’s because each crystal is made up of lots of even smaller crystals stuck together, or crystals containing too many impurities to form a repeating crystalline pattern that we can mathematically solve. If this one doesn’t deliver clear images, I’ll have to start over and set up another. Luckily, in this case, the first few images that pop up show bright, clear diffraction spots. I smile and sit back to collect the rest of the data set. Now as the gyroscope whirls and the X-ray beam blasts the sample, I have a few minutes to relax. I would drink some coffee to stay alert, but my hands are already shaking from caffeine overload. Instead, I call over to Nick: “I’m gonna take a lap.” I walk over to a group of tricycles sitting nearby. Normally used just to get around the large building containing the synchrotron, I find them equally helpful for a desperate attempt to wake up with some exercise. As I ride, I think about the crystal mounted on the gyroscope. I’ve spent months synthesizing it, and soon I’ll have a picture of it. With the picture, I’ll gain understanding of whether the modifications that I have made to it, which make it slightly different than other materials I have made in the past, have improved it at all. If I see evidence of better packing or increased intermolecular interactions, that could mean the molecule is a good candidate for testing in electronic devices. Exhausted, but happy because I’m collecting useful data, I slowly pedal around the loop, noting that the synchrotron is in high demand. When the beamline is running, it is used 24/7, which is why I’m working through the night. I was lucky to get a time slot at all. At other stations, other researchers like me are working late into the night. Custom-engineered structure enables unprecedented control and efficiency in otherwise impervious antiferromagnetic materials. 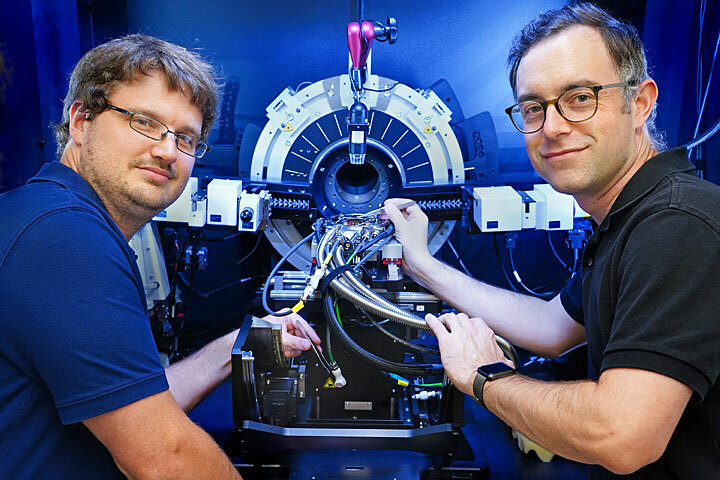 Brookhaven scientists Derek Meyers (left) and Mark Dean (right) using their x-ray diffractometer to characterize the atomic structure of the samples for the experiment. Consider the classic, permanent magnet: it both clings to the refrigerator and drives data storage in most devices. But another kind of impervious magnetism hides deep within many materials—a phenomenon called antiferromagnetism (AFM)—and is nearly imperceptible beyond the atomic scale. Now, a team of scientists just developed an unprecedented material that cracks open this hermetic magnetism, confirming a decades-old theory and creating new engineering possibilities. The team, led by the U.S. Department of Energy’s (DOE) Brookhaven National Laboratory and the University of Tennessee, designed AFM materials with spin—the quantum mechanism behind all magnetism—that can be easily controlled with minimal energy. The results, published this summer in Nature Physics, could dramatically enhance the emerging field of spintronics, where information is coded into the directional spin of electrons. The spin orientation of electrons within atoms and can be visualized as simple arrows pointing in well-defined directions. This flipping process powers the writing of digital information on most data storage devices, among other things. This perfect balance makes AFM spin notoriously impervious to manipulation, requiring too much energy to make the process useful. So the scientists introduced a little imperfection. While the canted spin can “feel” magnetic fields, the directional freedom is lost—the spins can no longer change direction. Imagine adjacent electrons as gears in a clock: the teeth all fit together to move in tandem and preserve precise relationships. Tilting the spin realigns those gears, almost as if they abruptly began to rotate in opposite directions and locked in place. How, then, to set those gears back in motion? In a way, they built another gear into their antiferromagnetic clock. The extra gear slots in between the jammed electron spins, giving them a balance and space that would never naturally occur. The “gear” is actually a hidden symmetry called SU(2), a mathematical term describing the isotropic freedom. The team used pulsed laser deposition to create a lattice composed of strontium, iridium, titanium, and oxygen. In this way, atomically thin layers could be stacked in different configurations to induce artificial and much desired properties. In this work, the team exploited special “gearing” properties of the iridium oxide layers in which the spins can be tilted, but remain free to respond to an applied magnetic field. The collaboration turned to the Advanced Photon Source (APS)—a DOE Office of Science User Facility at DOE’s Argonne National Laboratory—to confirm the crystal structure of the material. Using advanced resonant x-ray diffraction, the scientists revealed details of both the lattice and the electron configuration. Again turning to APS, the team used x-ray scattering to measure the antiferromagnetic order, the alignment of the spins within the material. Traditional magnetic devices have an intrinsic limit: packed too closely together, ferromagnetic materials affect each other. This translates into a functional cap on data density beyond which the spins become corrupted. However, AFM materials—or discrete AFM crystals in this instance—exert no external influence. The combination of low energy input—think efficient writing of data—and density make the new material an ideal candidate for investment. Additional collaborating institutions include Charles University in Prague. Researchers working at Argonne National Laboratory have identified a form of water trapped within diamonds that crystallized deep in the Earth’s mantle. (Pictured: Rough diamond in kimberlite.) Copyright Getty Images. Water occurs naturally as far as at least 250 miles below the Earth’s surface, according to a study published in Science last week by researchers from the University of Chicago and others. The discovery, which relies on extremely bright X-ray beams from the Advanced Photon Source at Argonne National Laboratory, could change our understanding of how water circulates deep in the Earth’s mantle and how heat escapes from the lower regions of our planet. The researchers identified a form of water known as Ice-VII, which was trapped within diamonds that crystallized deep in the Earth’s mantle. This is the first time Ice-VII has been discovered in a natural sample, making the compound a new mineral accepted by the International Mineralogical Association. The study is the latest in a long line of research projects at the Advanced Photon Source, a massive X-ray facility used by thousands of researchers every year, which have shed light on the composition and makeup of the deep Earth. Humans cannot explore these regions directly, so the Advanced Photon Source lets them use high-powered X-ray beams to analyze inclusions in diamonds formed in the deep Earth. 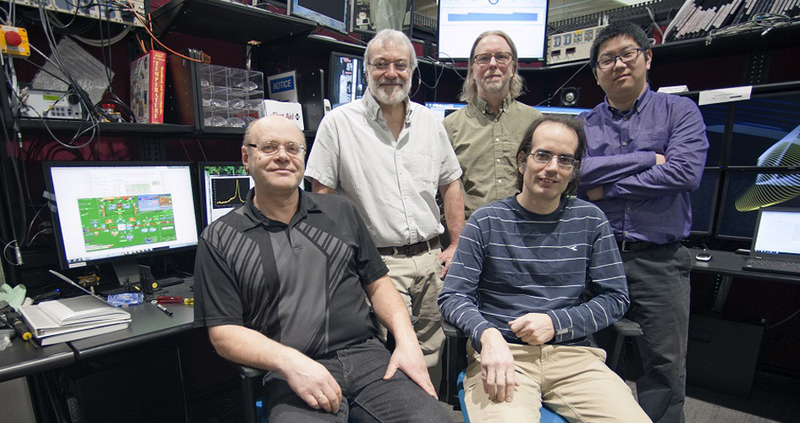 UChicago researchers involved in the work at Argonne’s Advanced Photon Source included (from left): Vitali Prakapenka, Tony Lanzirotti, Matt Newville, Eran Greenberg and Dongzhou Zhang. (Photo by Rick Fenner / Argonne National Laboratory). “We are interested in those inclusions because they tell us about the chemical composition and conditions in the deep Earth when the diamond was formed,” said Antonio Lanzirotti, a UChicago research associate professor and co-author on the study. In this case, researchers analyzed rough, uncut diamonds mined from regions in China and Africa. Using an optical microscope, mineralogists first identified inclusions, or impurities, which must have formed when the diamond crystallized. But to positively identify the composition of these inclusions, mineralogists needed a stronger instrument: the University of Chicago’s GeoSoilEnviroCARS’s beam lines at the Advanced Photon Source. Thanks to the very high brightness of the X-rays, which are a billion times more intense than typical X-ray machines, scientists can determine the molecular or atomic makeup of specimens that are only micrometers across. When the beam of X-rays hits the molecules of the specimen, they scatter into unique patterns that reveal their molecular makeup. What the team identified was surprising: water, in the form of ice. The composition of the water is the same as the water that we drink and use every day, but in a cubic crystalline form—the result of the extremely high pressure of the diamond. This form of water, Ice-VII, was created in the lab decades ago, but this study was the first to confirm that it also forms naturally. Because of the pressure required for diamonds to form, the scientists know that these specimens formed between 410 and 660 kilometers (250 to 410 miles) below the Earth’s surface. The researchers said the significance of the study is profound because it shows that flowing water is present much deeper below the Earth’s surface than originally thought. Going forward, the results raise a number of important questions about how water is recycled in the Earth and how heat is circulated. Oliver Tschauner, the lead author on the study and a mineralogist at University of Nevada in Las Vegas, said the discovery can help scientists create new, more accurate models of what’s going on inside the Earth, specifically how and where heat is generated under the Earth’s crust. This may help scientists better understand one of the driving mechanisms for plate tectonics. For now, the team is wondering whether the mineral Ice-VII will be renamed, now that it is officially a mineral. This is not the first mineral to be identified thanks to research done at the Advanced Photon Source GSECARS beamlines: Bridgmanite, the Earth’s most abundant mineral and a high-density form of magnesium iron silicate, was researched extensively there before it was named. Tschauner was a lead author on that study, too. “In this study, thanks to the amazing technical capabilities of the Advanced Photon Source, this team of researchers was able to pinpoint and study the exact area on the diamonds that trapped the water,” said Stephen Streiffer, Argonne associate laboratory director for photon sciences and director of the Advanced Photon Source. “That area was just a few microns wide. To put that in context, a human hair is about 75 microns wide. “This research, enabled by partners from the University of Chicago and the University of Nevada, Las Vegas, among other institutions, is just the latest example of how the APS is a vital tool for researchers across scientific disciplines,” he said. Other GSECARS co-authors are Eran Greenberg, Dongzhou Zhang and Matt Newville. In addition to the University of Chicago and UNLV, other institutions cited in the study include the California Institute of Technology, China University of Geosciences, the University of Hawaii at Manoa and the Royal Ontario Museum, Toronto. Data also was collected at Carnegie Institute of Washington’s High Pressure Collaborative Access Team at the Advanced Photon Source and the Advanced Light Source at Lawrence Berkeley National Lab. 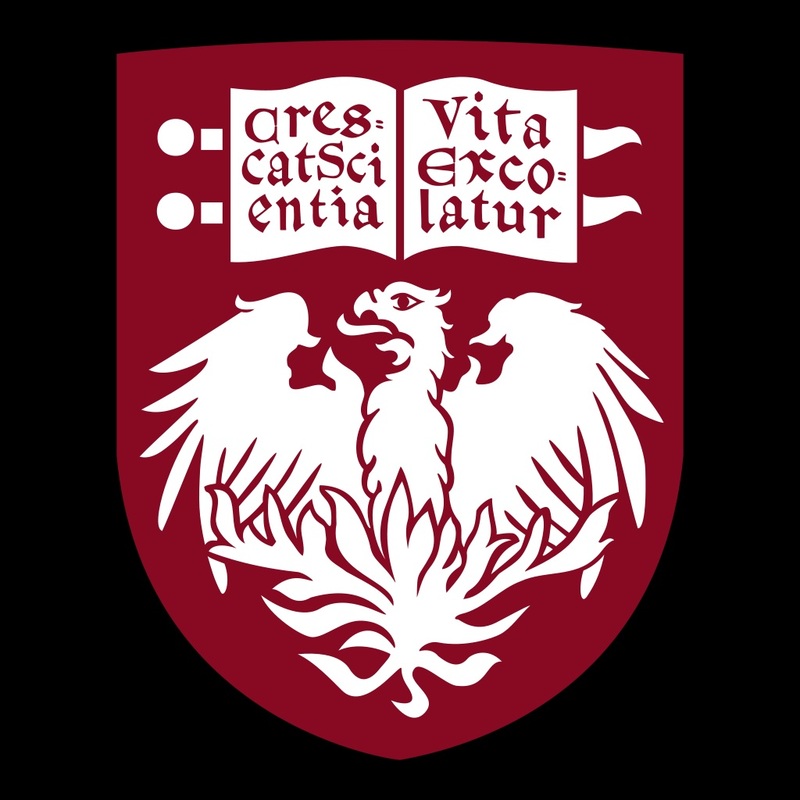 One of the world’s premier academic and research institutions, the University of Chicago has driven new ways of thinking since our 1890 founding. 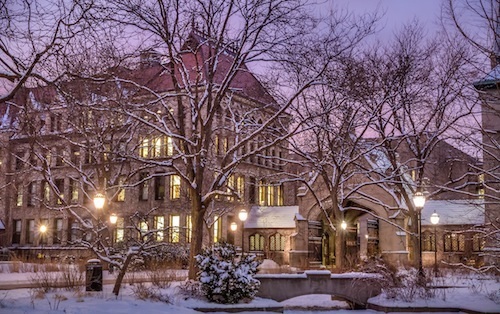 Today, UChicago is an intellectual destination that draws inspired scholars to our Hyde Park and international campuses, keeping UChicago at the nexus of ideas that challenge and change the world. Stephan Hruszkewycz. No image credit. 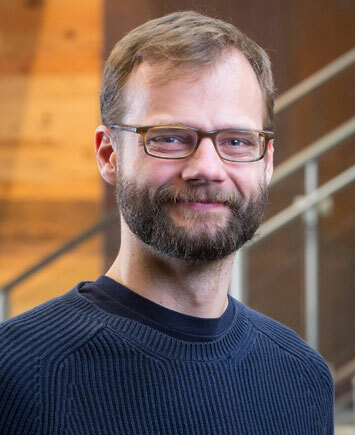 Stephan Hruskewycz is an assistant physicist in the Materials Science Division at the U.S. Department of Energy’s (DOE) Argonne National Laboratory. While he regularly conducts research at Argonne’s own synchrotron user facility, the Advanced Photon Source (APS), his work on the nanoscale structure and behavior of materials has led him to book beamtime at the DOE’s newest synchrotron, the National Synchrotron Light Source II (NSLS-II). Both NSLS-II and APS are DOE Office of Science User Facilities. What are you studying at NSLS-II? The focus of our NSLS-II experiments has been to image defects and imperfections in the crystal lattice of nanoscale materials using a new imaging technique known as Bragg Projection Ptychography. Specifically, we have been studying stacking faults in nanowires made of III-V semiconductors, a class of semiconductor that results from the combination of elements from column III on the periodic table (mainly aluminum, gallium, and indium) and column V (nitrogen, phosphorous, arsenic, and antimony). These materials have properties that make them excellent for certain applications; for example, solar cells made of III-V cells are very efficient. During our next run, we will be imaging strain fields in complex oxide thin-film nanostructures. These classes of materials have potential uses for energy conversion in solar and fuel cell applications, and their nanoscale structure plays a large role in performance. By studying these structures in detail, we may be able to figure out how to make these materials perform better. Why is NSLS-II is particularly suited to your work? The Hard X-ray Nanoprobe (HXN) beamline at NSLS-II delivers a coherent hard x-ray beam focused to a few tens of nanometers and the ability to rotate the sample and detector to enable Bragg diffraction with a nanofocused beam. We are capitalizing on the coherence and stability of the focused beam to convert a series of Bragg diffraction patterns measured from different overlapping positions of the sample into an image of the lattice structure inside a specific region of the crystal. The result provides an image with a resolution down to just a few nanometers, as well as picometer-level sensitivity to lattice distortions. Tell us about your background and how you arrived at this field of research. I have been interested for some time in developing new methods to exploit coherent hard x-rays to reveal of the structure and dynamics of materials. Recently, I have focused on applying these methods to materials with inhomogeneous internal lattice structures that dictate their overall properties, such as nanostructured oxide thin films and semiconductors. To me, this is an exciting area of research, one where cutting-edge materials science questions can be answered with new x-ray imaging methods at state-of-the-art synchrotron sources that deliver highly coherent beams. Who else is involved in this work? So far, I have been joined at NSLS-II by Megan Hill, a graduate student in Northwestern University’s Materials Science and Engineering Department; Martin Holt, a staff scientist in Argonne’s Center for Nanoscale Materials; and Brian Stephenson, a senior physicist in Argonne’s Materials Science Division. Berkeley Lab demonstrates a record-setting magnetic field for a prototype superconducting undulator. This Berkeley Lab-developed device, a niobium tin superconducting undulator prototype, set a record in magnetic field strength for a device of its kind. This type of undulator could be used to wiggle electron beams to emit light for a next generation of X-ray lasers. Researchers at the Department of Energy’s Lawrence Berkeley National Laboratory (Berkeley Lab) and Argonne National Laboratory have collaborated to design, build, and test two devices, called superconducting undulators, which could make X-ray free-electron lasers (FELs) more powerful, versatile, compact, and durable. X-ray FELs are powerful tools for studying the microscopic structure and other properties of samples, such as proteins that are key to drug design, exotic materials relevant to electronics and energy applications, and chemistry that is central to industrial processes like fuel production. The recent development effort was motivated by SLAC National Accelerator Laboratory’s upgrade of its Linac Coherent Light Source (LCLS), the nation’s only X-ray FEL. This upgrade, now underway, is known as LCLS-II. All existing X-ray FELS, including both LCLS and LCLS-II, use permanent magnet undulators to generate intense pulses of X-rays. These devices produce X-ray light by passing high-energy bunches of electrons through alternating magnetic fields produced by a series of permanent magnets. Superconducting undulators (SCUs) offer another technical solution and are considered among the most promising technologies to improve the performance of the next generation FELs, and of other types of light sources, such as Berkeley Lab’s Advanced Light Source (ALS) and Argonne’s Advanced Photon Source (APS). SCUs replace the permanent magnets in the undulator with superconducting coils. 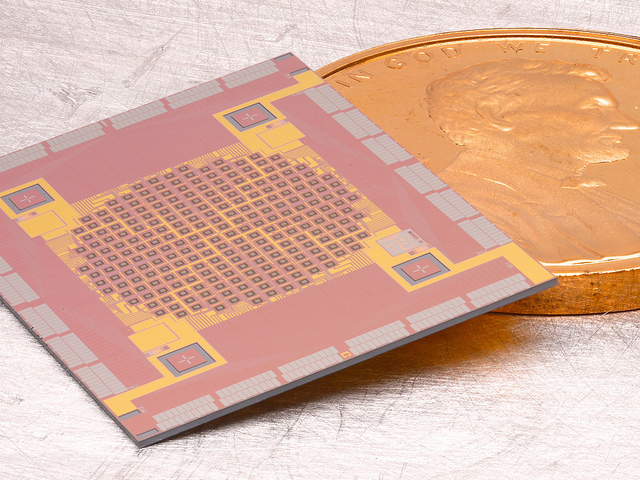 The prototype SCUs have successfully produced stronger magnetic fields than conventional undulators of the same size. Higher fields, in turn, can produce higher-energy free-electron laser light to open up a broader range of experiments. Berkeley Lab’s 1.5-meter-long prototype undulator, which uses a superconducting material known as niobium-tin (Nb3Sn), set a record in magnetic field strength for a device of its design during testing at the Lab in September 2016. Argonne’s test of another superconducting material, niobium-titanium, successfully reached its performance goal, and additionally passed a bevy of quality tests. Niobium-titanium has a lower maximum magnetic field strength than niobium-tin, but is further along in its development. 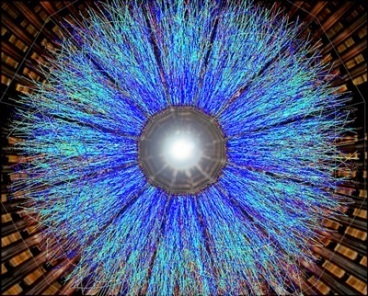 The recent development effort was motivated by SLAC National Accelerator Laboratory’s upgrade of its Linac Coherent Light Source (LCLS), the nation’s only X-ray FEL. This upgrade, now underway, is known as LCLS-II. All existing X-ray FELS, including both LCLS and LCLS-II, use permanent magnet undulators to generate intense pulses of X-rays. These devices produce X-ray light by passing high-energy bunches of electrons through alternating magnetic fields produced by a series of permanent magnets. “The superconducting technology in general, and especially with the niobium tin, lived up to its promise of being the highest performer,” said Ross Schlueter, Head of the Magnetics Department in Berkeley Lab’s Engineering Division. “We’re very excited about this world record. This device allows you to get a much higher photon energy” from a given electron beam energy. “We have expertise here both in free-electron laser undulators, as demonstrated in our role in leading the construction of LCLS-II’s undulators, and in synchrotron undulator development at the ALS,” noted Soren Prestemon, Director of the Berkeley Center for Magnet Technology (BCMT), which brings together the Accelerator Technology and Applied Physics Division (ATAP) and Engineering Division, to design and build a range of magnetic devices for scientific, medical, and other applications. “The Engineering Division has a long history of forefront research on undulators, and this work continues that tradition,” states Henrik von der Lippe, Director, Engineering Division. Diego Arbelaez, the lead engineer in the development of Berkeley Lab’s device, said earlier work at the Lab in building superconducting undulator prototypes for a different project were useful in informing the latest design, though there were still plenty of challenges. Niobium-tin is a brittle material that cannot be drawn into a wire. For practical use, a pliable wire, which contains the components that will form niobium-tin when heat-treated, is used for winding the undulator coils. The full undulator coil is then heat-treated in a furnace at 1,200 degrees Fahrenheit. After the heat treatment, the coils are placed in a mold and impregnated with epoxy to hold the superconducting coils in place. To achieve a superconducting state and demonstrate its record-setting performance, the device was immersed in a bath of liquid helium to cool it down to about minus 450 degrees Fahrenheit. Another challenge was in developing a fast shutoff to prevent catastrophic failure during an event known as “quenching.” During a quench, there is a sudden loss of superconductivity that can be caused by a small amount of heat generation. Uncontrolled quenching could lead to rapid heating that might damage the niobium-tin and surrounding copper and ruin the device. This is a critical issue for the niobium-tin undulators due to the extraordinary current densities they can support. Berkeley Lab’s Marcos Turqueti led the effort to engineer a quench-protection system that can detect the occurrence of quenching within a couple thousandths of a second and shut down its effects within 10 thousandths of a second. Arbelaez also helped devise a system to correct for magnetic-field errors while the undulator is in its superconducting state. SLAC’s Paul Emma, the accelerator physics lead for LCLS-II, coordinated the superconducting undulator development effort. Emma said that the niobium-tin superconducting undulator developed at Berkeley Lab shows potential but may require more extensive continuing R&D than Argonne’s niobium-titanium prototype. 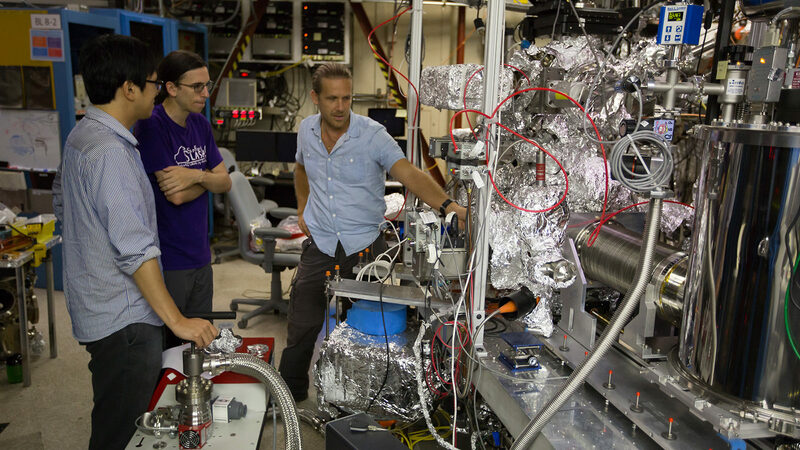 Argonne earlier developed superconducting undulators that are in use at its APS, and Berkeley Lab also hopes to add superconducting undulators at its ALS. A superconducting undulator of an equivalent length to a permanent magnetic undulator could produce light that is at least two to three times – perhaps up to 10 times – more powerful, and could also access a wider range in X-ray wavelengths, Emma said, producing a more efficient FEL. Superconducting undulators also have no macroscopic moving parts, so they could conceivably be tuned more quickly with high precision. Superconductors also are far less prone to damage by high-intensity radiation than permanent-magnet materials, a significant issue in high-power accelerators such as those that will be installed for LCLS-II. There appears to be a clear path forward to developing superconducting undulators for upgrades of existing and new X-ray free-electron lasers, Emma said, and for other types of light sources. James Symons, Berkeley Lab’s Associate Director for Physical Sciences, said, “We look forward to building on this effort by furthering our R&D on superconducting undulator systems. Antibiotics have saved millions of lives but have also been the cause of their own undoing. From the moment penicillin first started being used as an antibiotic in 1942, bacteria have been busily developing resistance to this life-saving drug and the others that have followed it. As we develop and use new antibiotics, bacteria develop resistance to them and we are forced into an arms race in which we must constantly develop new ways to battle these clever microscopic warriors. Penicillin was developed from a natural product that inhibits cell wall synthesis in bacteria. Although bacteria have found ways to circumvent the specific action of penicillin, the existence of other natural antibiotics that work by different but related mechanisms provides evidence that cell wall synthesis is still a good target for antibiotics. Now, results from the U.S. Department of Energy’s Advanced Photon Source (APS) have helped a team of researchers take an important step toward development of a new antibiotic that can block bacterial cell wall synthesis. The focus of the team’s effort is the MraY enzyme, an integral membrane protein that catalyzes the first step in peptidoglycan biosynthesis. Peptidoglycan is an essential component of the bacterial cell wall and is important for cell division – the process that bacteria use to multiply. The researchers, from the Duke University Medical Center, Hokkaido University (Japan), and Duke University, solved the crystal structure of MraY in complex with a natural inhibitor, muraymycinD2 (MD2), that has shown the ability — in animal models and in the lab — to kill some of the most lethal antibiotic resistant bacteria, including methicillin-resistant Staphylococcus aureus (MRSA), vancomycin-resistant Enterococcus (VRE), and Mycobacterium tuberculosis. Understanding how MD2 inhibits the MraY enzyme is crucial for developing a similar compound for clinical use in people. The structure, from x-ray data collected at the Southeast Regional Collaborative Access Team (SER-CAT) 22-ID-D and Northeastern Collaborative Access Team (NE-CAT) 24-ID-C beamlines at the APS, shows that MraY has 10 transmembrane helices (TMs) with 5 cytoplasmic loops. Most of the protein is in the membrane (Fig. 1). The catalytic site is a cleft framed by TM domains 3, 4, 5, 8, and 9, and loops B, C, D, and E. Three critical amino acids that are known to be important for catalysis and are conserved in this family of enzymes are located in the catalytic cleft. The APS is an Office of Science user facility. One of the interesting questions about the MD2 inhibitor is how it can bind MraY even though it does not look anything like the natural substrate of the enzyme. Specifically, MD2 is a competitive inhibitor of MraY but does not have the sugar and pyrophosphate groups that are required for the natural substrate of MraY. The structure shows that MD2 inserts between loops C and D and interacts with TM9, but does not interact with the three critical catalytic amino acids. Instead, it causes a large conformational change in MraY in which TM9 rotates away from the active site and loop E rearranges. These changes reshape the active site and are accompanied by further rearrangements in loops A and D and in TM domains 1 and 5, and the unwinding of loop C. MD2 interacts with the new active site created by the movements of TM9 and loop E and with the new rearrangements of TM5 and loops C and D.
All of this moving around also creates substantial changes in the nature of the charges that are present in the active site, a potential factor in binding of the inhibitor. Interestingly, mutational analysis shows that the MD2 inhibitor does not interact with the same area of the active site as the part of the substrate it was previously thought to mimic, the pyrophosphate group, and in vitro experiments show that magnesium (Mg2+), which is critical for the enzymatic activity, is not important for MD2 binding. The Advanced Photon Source at Argonne National Laboratory is one of five national synchrotron radiation light sources supported by the U.S. Department of Energy’s Office of Science to carry out applied and basic research to understand, predict, and ultimately control matter and energy at the electronic, atomic, and molecular levels, provide the foundations for new energy technologies, and support DOE missions in energy, environment, and national security. Modern cosmology experiments—such as the BICEP instruments and the in Antarctica—rely on superconducting photon detectors to capture signals from the early universe. Over the past several years, these X-ray spectrometers built at the NIST Boulder MicroFabrication Facility have been installed at three synchrotrons at US Department of Energy national laboratories: the National Synchrotron Light Source at Brookhaven National Laboratory, the Advanced Photon Source [APS] at Argonne National Laboratory and most recently at the Stanford Synchrotron Radiation Lightsource [SSRL] at SLAC National Accelerator Laboratory. A new technique to watch proteins in action involves applying large voltage pulses to protein crystals simultaneously with x-ray pulses, as shown in the photo (at left) of the experimental set-up in the BioCARS beamline at the APS. At right is a close-up view of a crystal sandwiched between electrodes that deliver the voltage. University of Texas Southwestern Medical Center researchers, in conjunction with colleagues from the University of Chicago, have developed a new imaging technique that makes x-ray images of proteins as they move in response to electric field pulses. The method could lead to new insights into how proteins work, said senior author Dr. Rama Ranganathan, of UT Southwestern. The technique had its first application in experiments at the U.S. Department of Energy Office of Science’s Advanced Photon Source (APS) at Argonne National Laboratory. The results were published in Nature. Often, Ranganathan said, the motions that underlie protein function are subtle and happen on time scales ranging from trillionths of a second to many seconds. “So far, we have had no direct way of ‘seeing’ the motions of amino acids over this range and with atomic precision, which has limited our ability to understand, engineer, and control proteins,” he said. The new method, which the researchers call EF-X (electric field-stimulated x-ray crystallography), is aimed at stimulating motions within proteins and visualizing those motions in real time at atomic resolution, he said. This approach makes it possible to create video-like images of proteins in action – a goal of future research, he explained. The method involves subjecting proteins to large electric fields of about 1 million volts per centimeter and simultaneously reading out the effects with x-ray crystallography, he said. The researchers’ EF-X experiments utilizing the BioCARS 14-ID x-ray beamline at the APS, which is an Office of Science user facility, showed proteins can sustain these intense electric fields, and further that the imaging method can expose the pattern of shape changes associated with a protein’s function. Additional standard crystallography data (in the absence of electric field) were collected at beamline 11-1, at Stanford Synchrotron Radiation Lightsource at the SLAC National Accelerator laboratory, also an Office of Science user facility. Ultimately, this work could explain how proteins work in both normal and disease states, with implications in protein engineering and drug discovery. An immediate goal is to make the method simple enough for other researchers to use, he added. “I think this work has opened a new door to understanding protein function. It is already capable of being used broadly for many very important problems in biology and medicine. But like any new method, there is room for many improvements that will come from both us and others. The first step will be to create a way for other scientists to use this method for themselves,” Ranganathan said. The group reports that they used the technique to study the PDZ domain of the human ubiquitin ligase protein LNX2, and found new information regarding how the protein actually works. 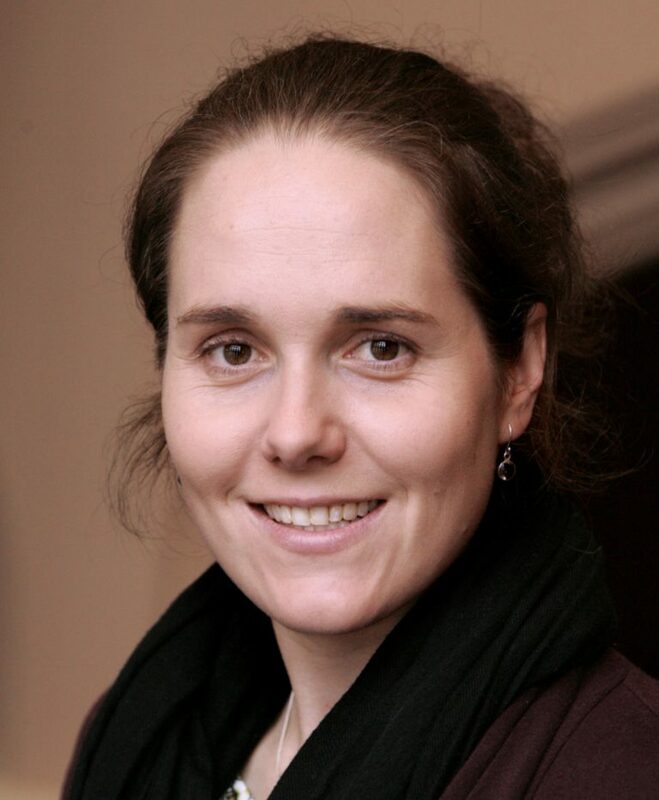 Claire White, an assistant professor of civil and environmental engineering and the Andlinger Center for Energy and the Environment at Princeton University, received a five-year CAREER grant from the National Science Foundation (NSF) to investigate more sustainable and resilient alternatives to Portland cement, a fundamental constituent in concrete and whose production emits one ton of carbon dioxide for every ton produced, accounting for five to eight percent of global carbon-dioxide emissions. The NSF supports junior faculty members, such as White, “who exemplify the role of teacher-scholars through outstanding research, excellent education, and the integration of education and research within the context of the mission of their organizations,” through their Faculty Early Career Development Program, according to the NSF website. With this grant, White and her research group will look at the long term durability of alternative cement binders made from blast furnace slag (also known as alkali-activated slag), a glass-like material that is a byproduct of steel production. Blast furnace slag is already recycled for use in concrete in order to reduce the amount of Portland cement powder used, but it can replace all the Portland cement needed in a batch of concrete via a chemical activation process, further reducing greenhouse emissions. Both Portland cement binder and alkali-activated slag binder have been shown to be equally strong, but the slag binder’s long term durability has not yet been fully determined – including when exposed to atmospheric carbon dioxide. The slag binder degrades in the presence of carbon dioxide in a process known as carbonation. This grant will allow White to investigate multiple types of alkali-activated slag, discover which among them is more resistant to carbonation, and understand the underlying chemistries of the materials. Being a byproduct of steel production, the properties of the slag, White explains, depend much on the mineral composition of iron ore that was used and the specific conditions used during the production of cast iron, which is a part of the steel manufacturing process. Before securing the grant, White and her team had already done preliminary work that found some alkali-activated slags to be more resistant to carbonation than other types of alkali-activated slag. This previous research was funded by a grant from Princeton E-ffiliates Partnership, a corporate affiliates program administered by the Andlinger Center. “We really want to understand why certain slags work better than others in these alkali-activated cements. And then we want to exploit the processes on why this good slag works, so we can tailor the materials to be even more resistant to carbon dioxide,” she said. 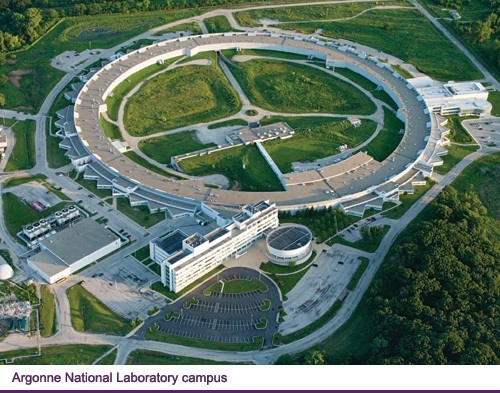 For the study, White and her team plan to visit Argonne National Laboratory, just outside Chicago, in order to use the facility’s high-end synchrotron, a special piece of equipment, to perform experiments. The synchrotron experiments will enable the team to track in high resolution the structural changes of the alkali-activated slag binder as it undergoes carbonation in real time – a process they can’t measure on campus. Though the grant only covers alkali-activated slag, White’s investigations may yield insight into other alternatives to Portland cement, such as fly ash, a coal burning byproduct, and ash derived from municipal solid-waste incineration. As part of the grant, White will also put together an educational component for teachers who want to incorporate engineering into their curriculum. White said she will put together lesson plans and teaching modules on how cement and related construction materials are used in a variety of engineering applications, and how engineers are critical for solving climate change. White earned bachelor degrees in civil engineering and physics from the University of Melbourne, Australia in 2006. She then earned her doctorate in chemical engineering from Melbourne as well in 2010. She joined the Andlinger Center in 2013 and is also an associate faculty member in the Department of Chemical and Biological Engineering and the Princeton Institute for the Science and Technology of Materials (PRISM). She was previously a Director’s postdoctoral fellow at the Los Alamos National Laboratory in Los Alamos, New Mexico. The mission of the Andlinger Center for Energy and the Environment (ACEE) is to develop solutions to ensure our energy and environmental future. To this end, the center supports a vibrant and expanding program of research and teaching in the areas of sustainable energy-technology development, energy efficiency, and environmental protection and remediation. A chief goal of the center is to translate fundamental knowledge into practical solutions that enable sustainable energy production and the protection of the environment and global climate from energy-related anthropogenic change. 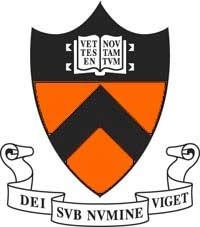 For more information on the Andlinger Center for Energy and the Environment at Princeton University, contact Sharon Adarlo, communications specialist, at sadarlo@princeton.edu or (609) 258-9979.